The convenience of two grits in one stone, medium on one side and coarse on the other. Great for sharpening pocket knives, hunting and fishing knives, utility knife blades, cutting tools for gardening, woodworking, and industrial cutting tool edge maintenance. 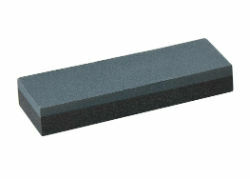 2"x 6" has 240 grit light grey medium side and 100 grit, dark grey coarse side.